THESE SOUND LIKE INFINITY IRS SERIES V's for a lot less money and take up a lot less space. I have IRS V's for comparison and these sound just like them. Speaker IMPEDANCE is 3.2 Ohms ( 4 Ohms Nominal Impedance ) for the woofer columns. I DO OWN A SET S/N 295A/B (WELL - NOW ALSO FOR SALE!). AMONG OTHER INFINITY IRS SPEAKERS. THUS, I AM VERY FAMILIAR W THESE AND OTHER INFINITY MODELS! THE ESIPLON'S, V'S, AND SIGMA'S ARE MY PREFERENCES - IN THE LISTED ORDER, AS FAR AS INFINITY SPEAKERS GO - EVEN OVER THE BIG 4-CHASSIS ONES. 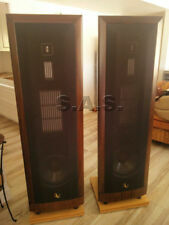 INFINITY IRS EPSILON SPEAKERS PAIR - ORIGINAL + BOXES + PRISTINE - S/N 295A/B!!! THESE WERE THE LAST IRS MODEL IN THE LATE 1990'S. IRS EPILSON'S - INFIINTY-CLASSICS. THE SPEAKERS ARE THE ONES SHOWN ON THE LEFT - IN THE PICTURES! NO OTHER SPEAKERS SHOWN ARE PART OF THIS SALE! 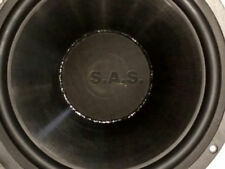 CONSIGNMENT - INFINITY IRS EPSILONS 12" CONTROLLED WOOFER - N.O.S - PRISTINE! THESE WERE IN PRODUCTION IN THE LATE 1990's. FOR SALE IS A 12" WOOFER - INFINITY P/N 902-6944. >>>>>> LINK TO OUR PAST PROJECTS & SALES! SO, NO WORRIES! NO ISSUES WHATSOEVER. SWEPTW AUDIO PERFECTLY ON MY BENCH. 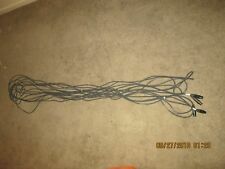 Servo Crossover Cables will also work with IRS Beta IRS V. These are in Perfect Working Condition! I used these on my working pair of IRS. Please note shipping will be paid by buyer with instructions on how and where to ship. Infinity speakers full set. Work like brand new. No scratches no mares. cones in great condition. I am the original owner. Have been oiled on the exterior monthly. All equipment to go with speakers. Manual included. Grills in perfect condition. All IRS servo equipment in mint condition. These speakers are my babies and I have loved them and their sound. Selling due to moving.Will ship if buyer willing to pay for shipping. Which would be determined by distance. And weight. Must sell moving and no space. Open to offers. These are like brand new. Sound is perfect. THEY WORK WELL--JUST GETTING TOO OLD NOW TO KEEP THEM. LOVED THEM FOR MANY YEARS. A COMPLETE ORIGINAL SET OF BETAS--THEY CAN BRING TEARS TO YOUR EYES FOR SURE! GOOD OLD INFINITY. THESE ARE AVAILABLE FOR PICK UP IN ORANGE COUNTY CA. 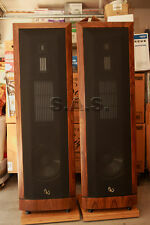 Infinity IRS legacy speakers are a known option when looking for high quality surround sound systems. When you're looking to turn your TV room into a home theater, surround sound speakers can really make a difference in quality. Here is an in-depth look at the IRS series legacy brand you will find on eBay. What is an Infinity IRS speaker? IRS is an acronym for Infinity Reference Standard. This name was given to a series of speakers introduced in 1980 by high-end speaker designer Infinity. The designers at Infinity had one goal in mind, to create a speaker system capable of reproducing the sound of a live concert as accurately as possible. How many different models were part of the IRS series? There were a total of four original speaker systems produced in the original IRS series. These were the IRS I, II, III, and V (there was no IRS IV). A subsequent line was developed alongside the original in the later years and sold at a slightly more affordable price point. This subset of the original bore the names IRS Beta, Gamma, Delta, Kappa, and Omega. Each system in the original series is listed below in chronological order. Infinity IRS (circa 1980): The prototype model featured a pair of woofer towers with six 12-inch polypropylene woofers, each driven by a 1500W amp. Infinity IRS II: This model contained a military grade accelerometer added to prevent damage at high volume. Infinity IRS III (circa 1987): This model didn't feature any significant change from the II. Infinity IRS V (circa 1988): Widely considered the pinnacle of the IRS model line, the IV featured new 2000W amp powered woofers. Why does the IRS cost more than other speakers? Artisan craftsmanship: The cabinets are hand-crafted from Rosewood for its acoustic properties and designed to maximize sound quality. Innovative design: The Infinity IRS system was meticulously designed, and much of the finished product consisted of parts that had never existed before. Limited production: The original IRS system was never produced in large numbers, and over time, that number has decreased even further. What to look for in an Infinity IRS system? As with any vintage purchase, a certain amount of wear and tear is should be expected. Because a large portion of a speaker's value is in the sound it produces, the core components should be functional. Minor restorative repairs should be anticipated and performed before subjecting the vintage system to heavy use. Content provided for informational purposes only. eBay is not affiliated with or endorsed by Infinity.